Did you know sugar can age your skin... maybe even faster than the sun? That's right. Sugar causes wrinkles through a process called glycation, creating Advanced Glycation End products (AGEs) that can make collagen and elastin proteins malformed, weak, and discolored. This leads to wrinkles, sagging, and dull, old-looking skin. You can try to avoid sugar, but unfortunately it is present in almost everything we consume these days. It's present in the food you eat and in the beverages you drink. Even "healthy" products like diet drinks and protein bars contain more sugar than you'd expect. SeroVital Day and Night Total Facial Rejuvenation System is so much more than just a wrinkle cream. The Theraglycan-3 compound has been tested on human skin and shown to make it appear measurably younger... 8-10 years younger, to be exact. But that's not all. The Day and Night Total Facial Rejuvenation System also contains amino acid complexes and "anti-aging" bioactives that have been tested on real people in a real-life setting and been clinically validated to not only reduce the look of fine lines, deep wrinkles, and crow's feet, but to improve the appearance of age spots, loose, droopy, flaccid skin, and - most importantly - make everyone's complexion look healthier, more radiant, and significantly younger. 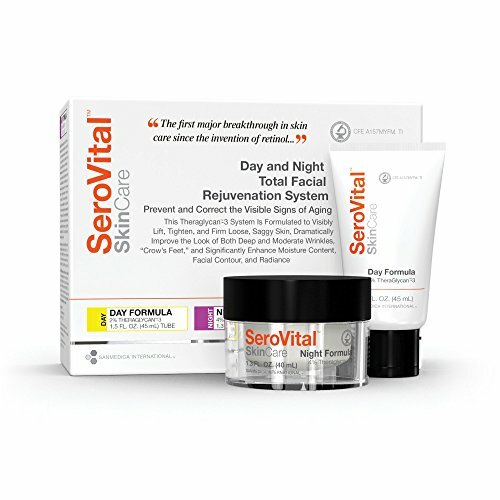 SeroVital's Day and Night Total Facial Rejuvenation System is a complete skin-care regimen. There are two aspects of this regimen. A highly concentrated cream for powerful overnight effectiveness.